1. 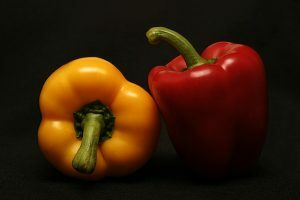 Bell Peppers: These vegetables are loaded with Vitamin C which makes your immune system stronger; water in them keeps you feeling full. 2. Radishes: They are healthy as they have phytosterols for reducing cholesterol levels. 3. Scallions: They are rich in Vitamin K that helps to make your bones strong. 4. Celery is healthy and gives energy; they are an ideal tasty snack when you are playing a sport. 5. Artichokes are loaded with powerful antioxidants and rich in potassium. 6. Cauliflower contains phytochemicals called sulforaphane that guard against prostate cancer; boron in it makes muscles strong. 7. Broccoli is known for containing minerals like calcium, folic acid and fibers, preventing cancers and regulating blood pressure levels while lowering cholesterol levels. 8. Cucumbers are rich sources of Vitamin C and potassium and are an integral part of Greek salads. 9. Strawberries are rich colored berries which are not only delicious to eat but they have cancer-fighting anthocyanin. 10. Melons are loaded with beta carotene, Vitamin A and potassium and help to keep your skin healthy and boost immunity. 11. Dill pickles also promote healthy skin and are used with other herbs and spices in brine to improve digestive functions. 12. Spinach is a green leafy vegetable rich in many important vitamins like Vitamin K for good bone health, Vitamins A for better vision; omega3 in it prevents heart diseases and strokes. 13. Asparagus helps to balance insulin in the blood; it is also a natural diuretic and a strong aphrodisiac. It brings down pressure levels and fights depression. 14. Romaine Lettuce is a low-calorie super food containing high amounts of Vitamin C and water. It stops cholesterol from sticking to the blood vessel walls. 15. Tomatillo is used for making healthy preserves and salads; it is low calories but high in flavor. 16. Palm hearts are rich sources of potassium. They help to improve bone strength and reduce blood pressure. 17. Mushrooms contain the antioxidant selenium that lets the body absorb the Vitamin E for good skin and hair. 18. Lemons contain pectin, a soluble fiber, and this is why lemons are often added to water to keep you feeling full. 19. 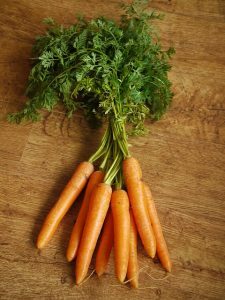 Carrots have beta-carotene, a strong antioxidant that can stop cell damage, boost immunity and slow down the aging process. 20. Summer squash contains very high amounts of carotenoids which prevent blindness. 21. Apricots are rich sources of Vitamins A and C, fibers and potassium. 22. Cabbages have a lot of fiber content and they are an excellent source of Vitamin C, folate, and B complex vitamins. 23. Eggs are an obvious super food because they are protein packed. The egg-whites have practically no fats and cholesterol. 24. Tomatoes are rich in potassium, beta-carotene and Vitamin C; they contain lycopene which can lessen inflammations and reduce chances of stroke. 25. Olives are healthy fat sources with a lot of Vitamin E; they can safeguard cells from the free radicals. 26. Pineapples also have anti-inflammatory properties which can help the muscles to relax post-workouts. 27. Star fruit is an excellent source for fibers and Vitamin C and it contains antioxidant flavonoids. 28. Green beans contain high amounts of silicon needed to make bones healthy and form connective tissues. 29. Snow peas are also rich sources of fibers and Vitamin C that improve digestion, boost immunity and lower cholesterol levels. 30. Brussels sprouts prevent cancers as these are rich in indoles which are phytochemicals. 31. Raisins are known to reduce blood pressure levels because of high potassium and they can lessen arterial stiffness because of dietary fiber. 32. Cherries have high potassium content for lowering blood pressure. 33. Plums are excellent sources of vitamins and beneficial for blood clotting. 34. Grapes are high-GI foods which release glycogen to give you energy when you have worked out. 35. Parmesan cheese in small amounts is a good source for calcium, phosphorus and proteins. 36. 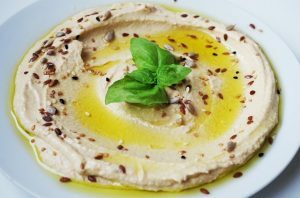 Hummus, produced by mixing ground chickpeas, olive oil and sesame seed paste, is both spicy and healthy. 37. Naked popcorn has high antioxidant levels which are comparable to high fiber foods. 38. Leeks are used as replacement for onions and are both healthy and sweet to taste. 39. Apples are arguably great sources of flavonoids, phytochemicals and carotenoids which prevent diseases and cancers. 40. Peaches are fiber -rich and contain vitamins; the antioxidant beta-carotene boosts the immunity system. 41. Okra with a high amount of antioxidants stabilizes blood sugar levels. 42. Grapefruits have compounds which can lower insulin and allow the body to metabolize fats. 43. Sugar-free gelatin contains copper that keeps your blood healthy; it has selenium that improves reproductive health. 44. Tangerines have large amounts of Vitamin C to help bones to grow and tissues to repair. 45. Oysters are loaded with proteins and provide selenium and zinc for better metabolism and immunity. 46. Kiwis have a lot of Vitamin C content and the carotenoids promote vision. 47. Asian pear is fiber-rich and promotes heart health and digestive functions. 48. Juice of watermelon before training lowers recovery heart rate in athletes and prevents muscle soreness. 49. Beets make blood vessels dilated and improve circulation. 50. Finally Korean kimchi and other fermented foods aid in weight loss because of high level of antioxidants.